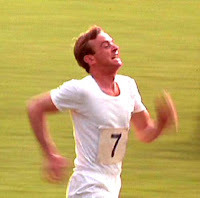 One Eternal Day: "When I run I feel His pleasure"
Chariots of Fire has finally made it to Blu-ray, and so I watched it again. Although it won its Oscar as long ago as 1981 it holds up very well, and the DVD is gorgeous. Something I learned from the extras was that Ian Charleson, the actor who plays Eric Liddell in the film, died 22 years ago, only 40. He was remarkably good in the role — he seemed natural, genuine, and, from all accounts, a good portrayal of the actual man. ...[F]or many Christians, the movie’s enduring appeal comes at least partly because of its sincere and sympathetic depiction of a believer who sacrificed for his theological convictions, despite severe criticism.